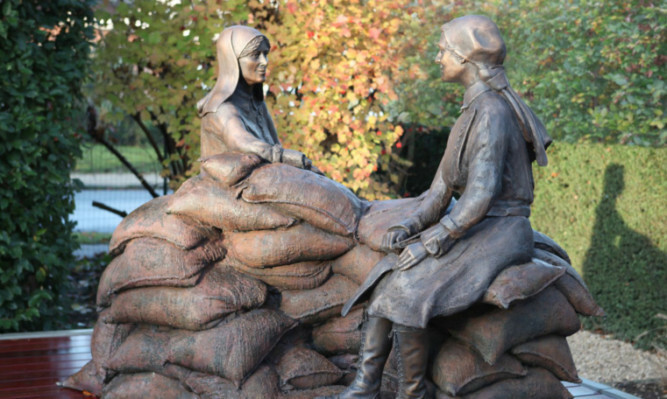 In 2013 Dr Diane Atkinson launched a campaign to build a statue in Ypres to the achievements of Mairi Chisolm and Elsie Knocker, First World War nurses known as “The Angels of Pervyse” who saved countless soldiers - their first-aid posts were only about 10 miles from Ypres, just 100 yards from the German trenches. In the spring of 1918 Pervyse was bombarded with gas shells. Fox terrier Shot woke Mairi and Elsie in time for them to put on their gas masks, but he died. Mairi recovered enough to return to the front and, when she came back to Britain, she and Elsie became members of the newly-formed Women’s Royal Air Force. This mix of a dedicated campaigner and the pride of Scotland in its women has resulted in the permanant recognition of true heroism.